Some of the best memories your child will make are running around, playing outdoors at Preschool, and being active in the amazing summer weather. However, all this running and physical activity in the heat of the day can put children, and adults, at risk for heat stroke, dehydration, harsh sunburns and other related types of complications. Heat stroke can be very dangerous and not always obvious if you don’t know the signs and symptoms to look out for. The good news is that parents and childcare providers can teach their children to recognize when they are getting too warm and take the right steps to cool off before it gets to that point. If the child is not adequately cooled off at this point, the symptoms may progress to full heat stroke and include elevated body temperature, hot dry skin, lack of sweat production, rapid pulse, difficulty in breathing and agitation and confusion. Always ensure that your child brings water with them outside and that they hydrate regularly throughout the day. At Premier Academy, each child has a water bottle that they have constant access to throughout the day. Children should be limited to water or sports drinks. Avoid soda, energy drink or anything containing caffeine. Wearing a hat helps keep direct sun off of your child’s head and wearing lighter colored, loose fitting clothing allows perspiration to evaporate and cool the body. Limit activity during the hottest parts of the day or when humidity is especially high. Last, and most important, never leave a child in a car unattended or leave a vehicle unlocked if there is a chance a child can climb into the vehicle and get stuck inside. The greatest cause of injury and death due to heat stroke is related to children being left in vehicles, often for as little as five minutes, resulting in tragedy that could have easily been prevented. For any other tips or advice on keeping your child cool in the summer months, ask our amazing teachers and staff at Premier Academy. 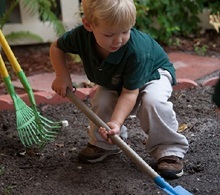 We are committed to providing you with quality childcare that ensures your child’s safety and growth. Visit our website at premieracademyinc.com for more parenting blogs, tips, and tricks!